NEW EPISODE! The Mix Lab Podcast #21 - Happy 2010! Welcome back and Happy 2010!!! It's a new year and we gonna start off with a new episode! Here is #21 and within this mix we Jnx The Kemist and myself (DJ JFresh-One) spinnin' new & classic hip-hop. Of course we put quality first and serve progressive joints from the underground and above surface. Keep a look out for the next episode and new podcast host later in the month or at beginning of February. The Mix Lab would be releasing an exclusive mixtape of Madlib! Plus we will be updating on how to stay connected to podcast. Enjoy, subscribe, and download for FREE! Welcome back to The Mix Lab, Happy New Year! Here some news to start off 2010...I know its been around the web for about a month or so. DJ/Producer/MC Madlib and Stones Throw Records will be releasing a once-a-month mixtape that totals to 12 CDs starting this month (January). 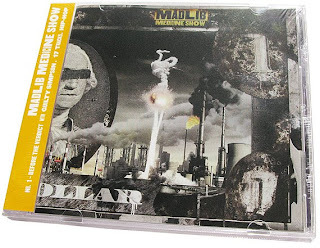 This special mixtape series is titled "Madlib's Medicine Show". Stones Throw Records are selling a limited amount of the first issue online as a pre-release advanced CD. Plus, you may also buy LP or CD over at UndergroundHipHop. Speaking of Madlib, here at The Mix Lab we will be droppin' a special podcast & mixtape this month featuring exclusively Madlib influenced tracks (produced, emceeing, features). If y'all enjoyed the J Dilla - Beats, Rhymes & Donuts, this will also be a dope addition to the iPod or stereo! Also expect another new episode and a couple other special mixtapes thats ready to launch!